Most of you don't really know that I'm a massive royalist and by massive, I mean MASSIVE. I love anything to do with the royal family, their history, the corgis, aristocracy, the pomp and ceremony, THE LOT! Poor Jamie has to put up with it, but a few weekends ago I took it to another level. I decided we would get up at the crack of dawn, go down to London and get in the crowd for the Trooping of the Colour. 2 hours passed in the packed in, sweaty crowds, nothing but chatter and the sights of it all to keep us amused. Honest to god I don't know how we didn't need a wee, I think even if I had I wouldn't have moved an inch! Then the noise of the guards band slowly made its way up the mall, the anticipation was killing me. All of a sudden there they were 'THE' Royal Family, Kate, Camilla and HARRY! I'm surprised how my hand didn't fall off with all the waving and that I didn't jump over the barriers and get in the carriage with him. Sadly good ol' Liz decided she wouldn't follow the rules of driving on the left hand side of the road and went on the other side of the road. Mind you, you couldn't miss her in that outfit. 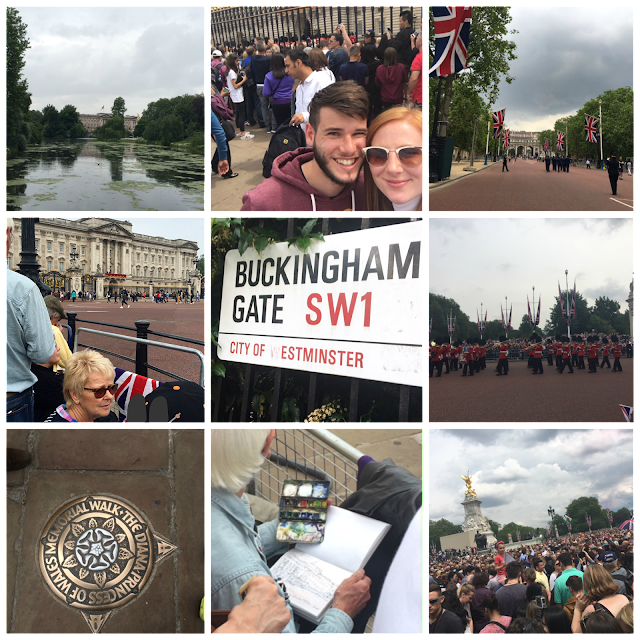 Luckily we had a tip off from one of the Police Officers that they would be opening up the mall and the side crowds into the space in front of Buckingham Palace, so we made our way to the back of the crowd and waited. Then we got the news that they would be releasing those in the mall first, I was more than peeved. Thank god we waited where we were and didn't move as the gates opened and we sprinted to the gates of Buckingham Palace. I didn't care what anyone thought and I'm so glad I didn't because we had one person in front of us and there were the gates. A few minutes later and they were out on the balcony. It was the same buzz as seeing your favourite celeb or band, the colours of their clothes, their faces, it was amazing. I couldn't stop taking photos and as much as I had limited phone battery, I knew these would last me a lifetime. It was amazing standing in that huge crowd with people from all over the world coming together to celebrate her birthday. The fly past was incredible and I had chills as we sung the national anthem. Before I knew it, that was it, done. We'd spent 9 hours more or less in the same tiny spot, up against the barrier to get just a few glimpses of the Royals. Jamie might say that it was pretty pointless, but it's something that will last my lifetime. No doubt I'll be dragging him there again next year and to more Royal events, this time I'm going to be entering the public ballot so rather than leaning up against a french girl, I'll be sitting next to one!